These have to be, without a doubt, the coolest car beds we’ve come across. And it’s not just because of their minimalist design. It’s because they’re just so darn clever! Yes, you read correctly – these car beds are stackable. There’s no need for a sofa bed, or trundle when you have extra children under your roof for the night. Just unstack the Speedoletto beds and hey presto, you’re done! The Speedoletto beds are the most modern take on bunks or trundles that we’ve seen. 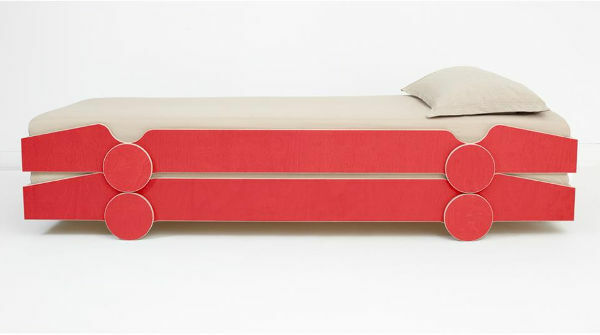 Made in Germany, designed in France and made from Finland wood, these rather worldly beds are stunning. The wheels of the beds allow them to be stacked, without fear of them slipping. There are inclined lines at the front and rear which allow for handling the bed. There’s even a horizontal line between the wheels which has the purpose of allowing each of the mattresses to breathe. This is our kind of racing car bed! The Speedoletto comes in a rainbow of colours, and are purchased as a set for €1690. The matresses and lath floor are not included, and shipping costs to Australia are available by contacting Speedoletto directly.